The campaign in the London Underground is the last accent of the three-year project "Market Focus: Poland" at the London Book Fair 2017, during which 1650 posters will be hung in the metro cars. 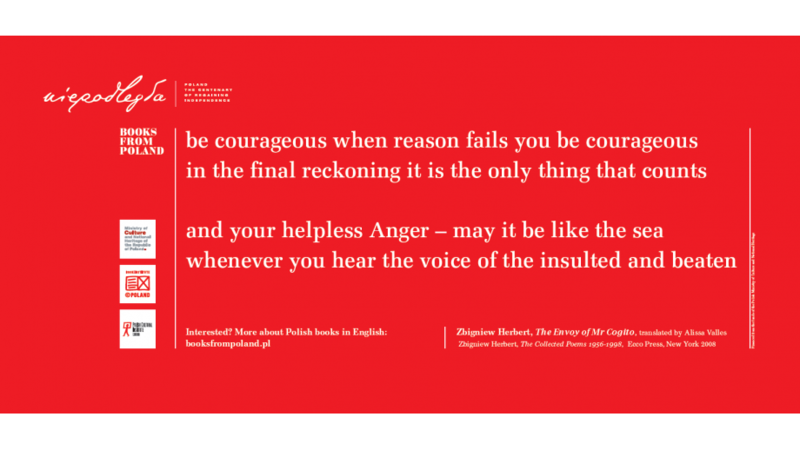 The aim of the campaign is to draw attention to Polish literature and its translation into English, especially in the context of the 100th anniversary of independence. Poland survived the years of the partitions thanks to culture. That is why one of the texts we have selected, which are presented in the London underground, is a fragment of the Polish national epic Pan Tadeusz, in a new congenial translation by Bill Johnston (the book was recently published by the Archipelago publishing house, and Bill Johnston was a guest of the Book Institute with lectures on Pan Tadeusz and Mickiewicz in London, Oxford, the Museum of Pan Tadeusz in Wrocław and at the Jagiellonian University). 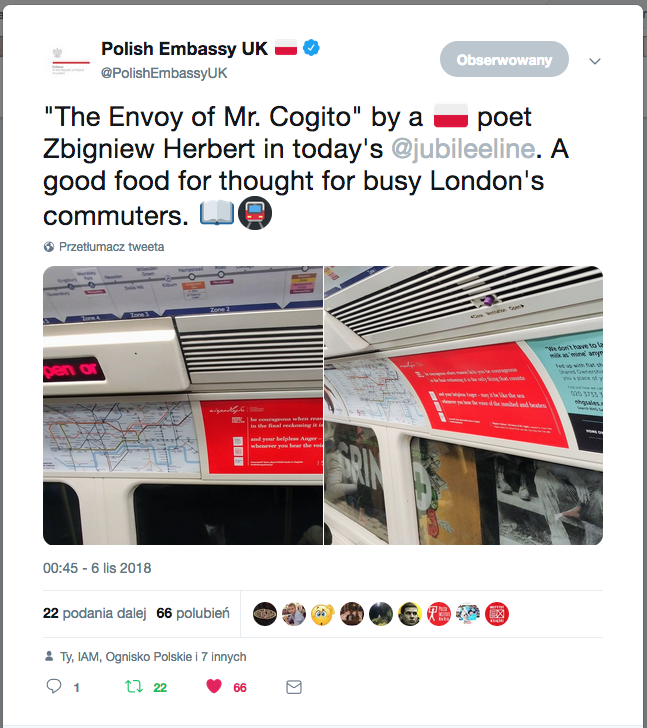 Passengers of the London Underground will also be able to read Herbert's The Envoy of Mr. Cogito and Oktoostychy by Jarosław Marek Rymkiewicz in Marek Kazmierski's translation. Polish literature is experiencing a great time in Great Britain. The English-language market has recently been thrilled by Olga Tokarczuk's novels, the English translation of Flights by Jennifer Croft, which was published thanks to the support of the Book Institute as part of the ©POLAND Translation Programme, and was awarded the Man Booker International Prize. It was also published in Australia and the USA. Currently, the translation of the novel Drive Your Plow over the Bones of the Dead, which was presented to English-speaking readers by Antonio Lloyd-Jones, is very popular in Great Britain. Lala, a novel by Jacek Dehnel, another author promoted under the "Market Focus: Poland" programme, translated by Antonia Lloyd-Jones and published by Oneworld Publications, was nominated for the award for the best debut of the Edinburgh festival. The same publisher announces that the first volume of Professor Szczupaczynska's adventures, written by Jacek Dehnel and Piotr TarczyTarczyński under the pseudonym Maryla Szymiczkowa will be published in January 2019.